Infantile hypertrophic pyloric stenosis (IHPS) is a condition affecting young infants in which there is gastric outlet obstruction secondary to hypertrophy and failure of relaxation of the muscular wall and thickening of the mucosa of the antropyloric portion of the stomach. Although the etiology of IHPS remains unknown, its diagnosis and treatment are highly successful. Physical examination and imaging with ultrasound are the most important diagnostic considerations, while treatment with pyloromyotomy is typically curative. 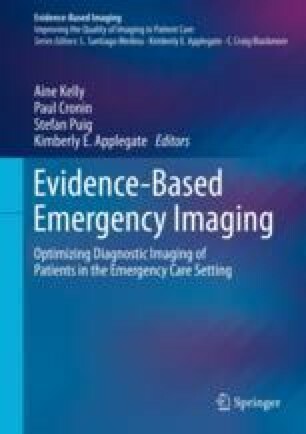 The purpose of this review is to consider the etiological hypotheses and epidemiology of the condition and to examine the evidence supporting the various diagnostic investigations. The author would like to acknowledge the work of Drs. Barry R. Berch and Wallace W. Neblett III, her coauthors on two previous chapters (both titled Imaging of Infantile Hypertrophic Pyloric Stenosis by Marta Hernanz-Schulman, Barry R. Berch, and Wallace W. Neblett III, one in Medina LS et al., eds: Evidence-Based Imaging: Improving the Quality of Imaging in Patient Care (2011), and the other in Medina LS et al., eds: Evidence-Based Imaging in Pediatrics: Improving the Quality of Imaging in Patient Care (2010), both published by Springer Science), which served as a starting point for this current chapter.